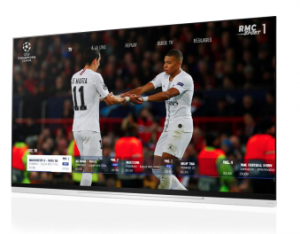 Altice France has teamed up with LG Electronics to launch its RMC Sport app on the latter’s smart TVs in France. The launch will mean that RMC Sport subscribers will be able to access content including next week’s UEFA Champions League match between PSG and Manchester United and the Europa League fixture between Rennes and Arsenal the following day, along with tomorrow’s English Premier League match between Tottanham Hotspur and Arsenal and the match between Everton and Liverpool on Sunday. Users of the app will be able to view live streams of all RMC Sport channels along with additional original content and services and catch-up content. RMC Sport, in addition to the Champions and Europa Leagues and the English Premier League, holds the rights in France to La Liga Portugaise, EuroLeague and EuroCup basketball and ATP 250 tennis from Lyon.